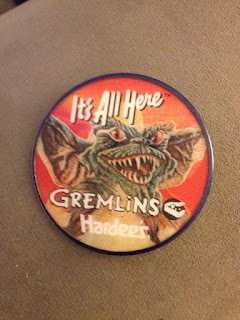 The Horror Movie BBQ: The Hardees Gremlins Flicker Button! So my awesome girlfriend got me an awesome early birthday present. So what's the natural thing to do? Share it with the world! So I'm a promo button collector and a Gremlins fanatic. 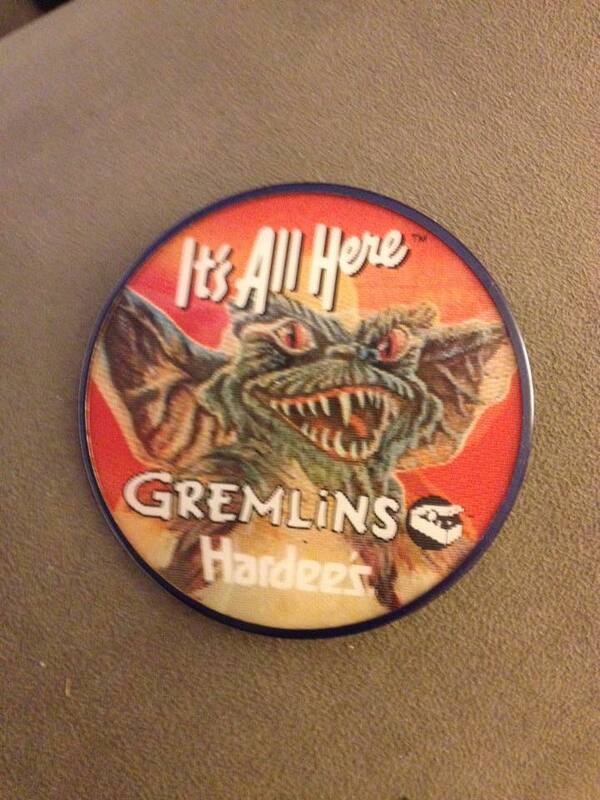 So naturally, I've always needed a Gremlins button for my collection. But, other than custom buttons, there aren't a whole lot that I liked. 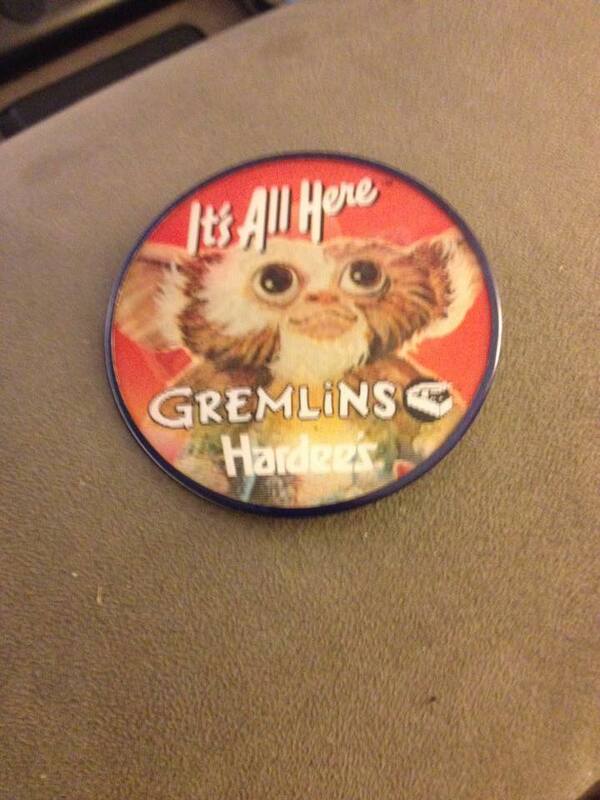 But then, I found, after a fun eBay search, there was a Hardees employee button that I wanted. I had gone to Hardees plenty of times as a kid, it made perfect sense! But, the seller was asking way too much. I'd look for one a few more times, but again, too much. As great as it looked, I'm not spending 35 bucks for it. Yup. Thar she blows! With just one flick of the wrist, you can turn Stripe in Gizmo and vice versa. Sweet gimmick, eh? 1980s technology at it's finest! Now you see why I think I have the best girlfriend ever. She's so very thoughtful and she knows what I like. Now, I know what you're asking. Why the heck would Hardees celebrate Gremlins? This relationship makes NO sense! Well, around the time Gremlins came out, Hardees sold special book and record sets detailing events from the movie in beautiful 1980s storybook fashion as well as a fun record read by some 50 year Hardees employee who probably never seen the movie but was being paid enough to put out a valiant effort. Here's a sample of one of the stories. This was at a point when Hardees was pretty popular. Hardees was pretty wide spread in Maryland and Virginia, so I was able to go there a lot with my dad, as I've gone into in a previous entry about their Halloween offerings, so this button does hold some sort of weird, 9 degrees of nostalgia. Better not get it wet though. What a lovely girl! Such a nice treat. Even better, I got it super cheap!